Benji Davies is a bright talent in picture books. His first book, The Storm Whale, won awards and has been called 'timeless' and 'a future classic'. I feel the same way about Grandad's Island. On the one hand, this is a great adventure story. A young boy, Syd, visits his grandfather and together they step through a metal door in Grandad's attic that leads them onto the deck of a very tall ship. They set sail and eventually come upon a magical tropical island. They explore it from top to bottom, move into an old shack, and swoosh down waterfalls. And then, after Grandad decides to stay behind, the boy sails safely home again. On the other hand, this is a story of dealing with loss, and learning that those whom we love will always remain near to us, no matter how far away they actually are. For Grandad loves Syd, and Syd loves Grandad. And that will never change. Even when Grandad isn't there for Syd to visit anymore. My daughter and I read this together. Her grandfather passed away late last year, so she related to the story on that level, commenting that she knew Syd would never forget his grandfather in just the same way she wouldn't forget hers. Other children might find this a comforting story if a grandparent has to go into care or if they simply move away. 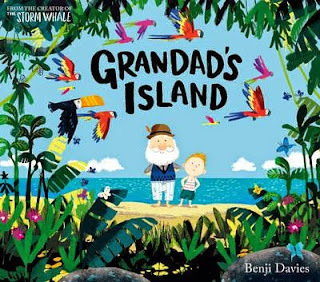 However, I've also read it with a four-year-old boy who just wanted to find the island and have some adventures there of his own! So, it's a story that works across ages and on multiple levels, from the deeply sensitive to the purely fun. Benji Davies' illustrations perfectly reflect the changing mood of the boy. From the bright joyfulness of the island, to the dark, stormy waters as the boy sails home alone, each page's imagery adds layers of meaning to the simple text. I can't wait for this talented author/illustrator's next book.